Gas engine-driven cooling is an economical alternative to high electric costs and electric demand charges, providing operating cost savings that can easily offset equipment cost. Depending on natural gas and electric rates and demand charges, payback periods for gas engine-driven chillers vary, but can often range from two to four years. You can estimate a likely payback period based on the natural gas and electric rates in your area using the Payback Calculator. 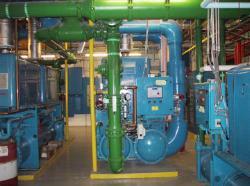 The uses of natural gas engine-drive chillers are as varied as the available systems. The following case studies demonstrate what happens when gas technologies are applied to real-world situations. Bulova watches as engine-driven chillers eliminate demand charges and provide free hot water for the health spa, fitness facility, swimming pool, art museum, conference center and retail space at its corporate center. CNN is making news and taking advantage of real-time pricing by replacing one of its three electric centrifugal chillers with a natural gas engine-driven chiller. For nonprofit YMCA, engine-driven chillers are easy on the budget and complement existing cogeneration plant. Natural gas, engine-driven centrifugal chiller delivers unprecedented part-load efficiency, quiet operation and a COP above 2.3. Natural gas engine-driven chiller and desiccant dehumidification fueled by engine waste heat keep ice and air clear and costs down. Win-win is how management at Queens’ Aqueduct Racetrack describes its choice of natural gas chillers. Nervous clients keep their cool in Family Courthouse while Philadelphia’s Department of Public Property takes advantage of “the great bubble” of summertime natural gas. Gas chiller proves more efficient than individual room air conditioning units and provides thermal energy for domestic hot water. Reduced emergency generator needs result in payback period of less than two months thanks to natural gas cooling. Rockville, Maryland college uses gas chiller for ice production at night and to shave peak demand charges by day. A zoned chilled water system solved ductwork and cost problems for the New England Culinary Institute’s kitchen and restaurant. Local utility’s demand side management program lowers aquarium’s operating costs and helps utility manage its load. The efficiency of natural gas and utility incentives help home for aging meet its charitable mission. Meeting cooling regulations required for operating rooms led VA medical center to upgrade its outdated system; reducing peak electric demand and ratchet charge penalties led them to natural gas. Gas engine driven chiller produces ice and chilled water to assist desiccant dryers in maintaining low humidity. Flexibility for growth, dependability during power outages, reliable service and quiet operation made natural gas a better choice for one of the nation’s fastest-growing hospitals. Six new gas engine-driven cogeneration modules and a gas engine-driven chiller are helping this LA-area hospital achieve its goals: keeping the environment clean, maximizing energy efficiency and saving money. Building boasts a one-of-a-kind tri-fuel plant that uses electric-, steam- and natural gas-powered chillers to meet increased cooling demands and achieve substantial savings in energy costs.